Power BI Pro is an individual license that allows access to all content and capabilities in the Power BI service, including the ability to share content and collaborate with other Pro users. Only Pro users can publish to and consume content from app workspaces, share dashboards, and subscribe to dashboards and reports. For more information, see Power BI features by license type. 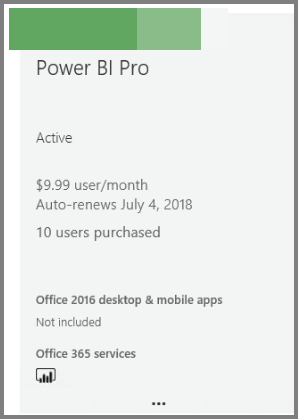 This article first explains how to purchase Power BI Pro licenses in Office 365. The article then explains the two options you have for assigning those licenses to individual users: Office 365 and Azure (choose one option). You must be a member of the Global administrator or Billing administrator role in Office 365. To assign licenses in Azure, you must be an owner of the Azure subscription that Power BI uses for Active Directory lookups. In the upper right corner of the Subscriptions page, select Add subscriptions. Under Enterprise Suite, select Office 365 Enterprise E5. Under Other Plans, select Power BI Pro. Hover over the ellipsis (. . .) for the desired subscription, and select Buy now. Choose Pay monthly or Pay for a full year, according to your billing preference. Under How many users do you want? enter the desired number of licenses, and then select Check out now to complete the transaction. Verify that the acquired subscription is now listed on the Subscriptions page. 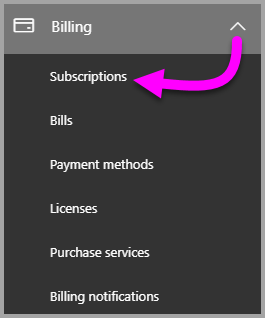 To add more licenses after the initial purchase, select Power BI Pro from the Subscriptions page, and then select Add/Remove licenses. 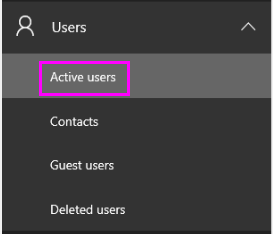 On the left navigation pane, expand Users, and then select Active users. Select a user, then under Product licenses select Edit. 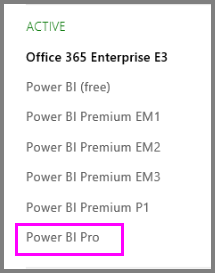 Under Power BI Pro, toggle the setting to On, then select Save. Under Status for the selected account, verify that the Power BI Pro license has been assigned successfully. 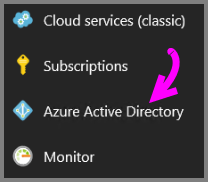 In the left navigation bar, select Azure Active Directory. Under Azure Active Directory, select Licenses. 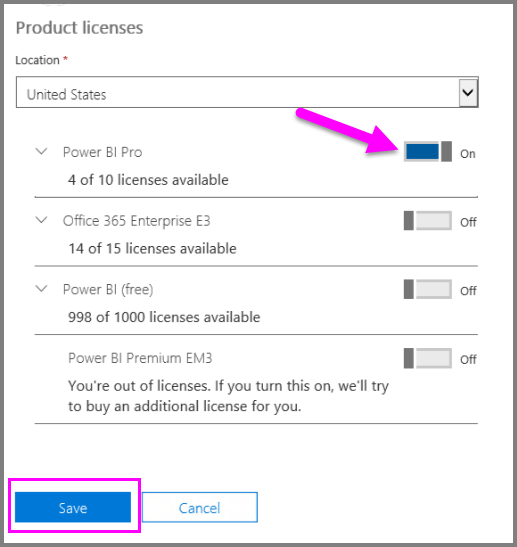 Under Licenses, select All products then select Power BI Pro to display the list of licensed users. Select Assign to add a Power BI Pro license to an additional user account. Now that you've assigned licenses, learn more about Power BI Pro.